Just Like My Mom Used to Make – This Girl Loves to Eat! I’ve been feeling very under the weather for nearly a week and haven’t felt much like eating, let alone cooking. 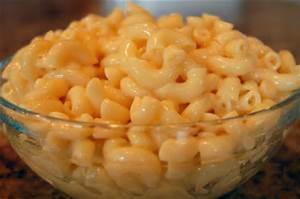 Macaroni and Cheese – My Mom wasn’t particularly talented in the kitchen, but she could make a mean box of Kraft Macaroni and Cheese. Once they came out with the “Kraft Deluxe” with the (then) tiny cans of premade cheese sauce in them, she didn’t even have to add the milk and butter. Her idea of perfection! I shared her love of the Kraft Deluxe until about 5 years ago when the sauce (now in a foil pouch) got a little thinner and tasted less “cheesy.” When I don’t take the time to make my own homemade macaroni and cheese from scratch, I have gone back to stocking the cupboard with the old school, original Kraft Macaroni and Cheese in the blue box with the powdered cheese. Tuna Sandwich on White Bread – My Grandpa Bob set the standard for tuna preparation in our family. He would buy tuna in oil (likely a lot of the reason he had quadruple bypass surgery in his 50’s), drain it and mix it together with meticulously chopped onions, a ton of mayonnaise (which has never been my favorite, in fact I rarely use it), and he’d pile it on plain white bread (something most people, myself included, rarely eat anymore), slice it in half, and make as many as would fit in his tan and red plaid “picnic” bag with a plastic sandwich box and thermos of “adult” refreshments. If he was making sandwiches for us kids to eat on the beach at Lake Gregory in Crestline he would leave the onions out and there would be a thermos of lemonade for us to drink. Grilled Cheese on Sourdough and Tomato Soup: Down and dirty made with 2 pieces of heavily buttered (none of that icky margarine spread for this girl!) thick cut sourdough bread and at least 3 pieces of Kraft Singles American Cheese (no other brand makes it into my shopping cart). Fried until brown and crispy and served along side a bowl of Campbell’s Tomato Soup made with milk (never water) and with a pat of butter floating on top. Add a bowl of buttered popcorn to this and I’m pretty darn good. Mashed Potatoes – Reminder, my Mom didn’t cook much from scratch, so it should be no big surprise that I grew up on Hungry Jack potatoes from the box if we were eating mashed potatoes at home. My grandma, however, made the creamy, buttery mashed russet potatoes I dream about when I am too sick to keep much down and just want to feel better. Nothing beats a few peeled, boiled potatoes mashed (with chunks – I love the chunks) with a ton of butter and milk. 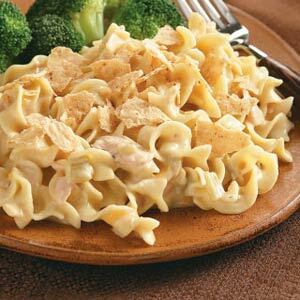 I prefer to make them like my Grandma Skip did, but I use half & half or even whipping cream if I have it on hand. When I mention how much I love tuna noodle casserole to most people, their faces screw up and usually I get a negative reaction. Their Moms’ versions of tuna noodle casserole must have had some icky ingredients like cornflakes, ritz crackers, bread crumbs and even peas. They may think it’s gross, but my Mom’s stripped down, no-frills version is the best I’ve ever eaten. Boil, noodles according to package instructions, and drain in a colander. I prefer American Beauty noodles because they seem to stand up to the sauce without going limp if any remains to re-heat the next day. Also, because their tuna is guaranteed Dolphin safe, wild caught, gluten free and readily available, I prefer Chicken of the Sea Chunk Light Tuna. Open and drain the tuna in a colander. Empty the Cream of Celery soup into a large saucepan. Fill the empty soup can first with milk then with mayonnaise, adding both to the pan with the soup. Add the drained tuna, salt and pepper to taste, and stir over low heat until hot but not boiling. Empty the noodles into a large mixing bowl or the same pan you cooked them in and pour the hot sauce over the noodles, making sure to use a rubber spatula to get all of the sauce out of the pan. Use the same spatula to combine the noodles and sauce until well mixed. You can serve it immediately, but I find that if you let it cool slightly the sauce thickens up. Posted on October 1, 2015 October 1, 2015 by ls1228Posted in comfort food, RecipesTagged dolphin safe, grilled cheese on sourdough, kraft blue box macaroni and cheese, kraft singles, macaroni and cheese, mashed potatoes, tomato soup, tuna noodle casserole, tuna sandwich, wild caught.